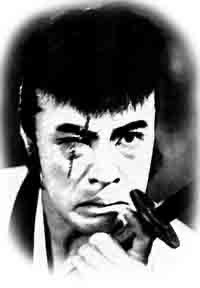 I published my book on Kinugasa Teinosuke’s silent masterpiece A Page of Madness (狂った一頁, Kurutta ichipeiji, 1926) nearly ten years ago. One of my main regrets is that there has been no DVD of the film available for people to watch as they read my book or as the book is taught in classes. 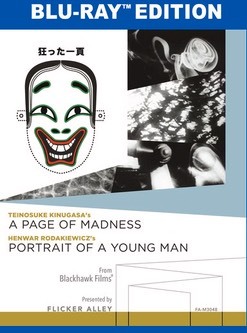 I have written about this before, but the National Film Center in Japan has the best print of the film (one that has been restored to its original silent aspect ratio) and has been trying to put out a DVD for years. Their lack of experience in publishing a DVD and some issues with Kinugasa’s family had long delayed the project. (Until recently, they didn’t even lend out the print because of that problem with the family.) I told them that if they don’t act soon, someone else will put out a DVD, which is what happened with a cut-rate DVD of Kinugasa’s Crossroads (Jujiro, 1928) that came out in 2009. Well, someone has. And unlike the cheap DVD of Crossroads (which is in fact not that bad), this has actually been produced by a respectable place. The film preservationist David Shepard collaborated with Flicker Alley to put out a Blu-ray disk of A Page of Madness from a good 16mm print (likely from the once-circulating Blackhawk Films collection Shepard bought—this was probably the print I saw in graduate school when I first viewed A Page of Madness). The disk also includes Henwar Rodakiewicz’s Portrait of a Young Man (1925-31). As a bonus, there is an episode of CUNY TV’s "Cinema Then Cinema Now” featuring host Jerry Carlson leading a discussion on the film with psychoanalyst Dr. Harvey Roy Greenberg and film historian Joseph Anderson (not all they say is accurate, but the discussion is interesting nonetheless). As an online extra, Flicker Alley has posted on their site one of my essays on the film, entitled “A Page of Madness: Understanding a Work in its Time," that I penned when I was first writing the book. You can access that here. I should be honest and say that the print is not as good as the NFC print (obviously). The contrast has weakened, some of the lines are less sharp, and some things don’t appear clearly in dark scenes. It reminds you that even Blu-rays are not a good substitute for a clean 35mm print. But it is still a good print, one better than the versions of the film you can see on YouTube or get via bootlegs. Two good things about this version is that they, first, adjusted the speed so that it is 20 frames per second (which extends the 59 minute sound speed version to about 70 minutes), bringing it closer to what was likely the speed when it was first released. (I have seen YouTube versions that seem to be at 18 fps, but they just look slow.) That change meant they had to remove the music by the Modern Bamboo Flute Ensemble that Kinugasa prepared for the film’s re-release in the 1970s (done for the film projected at sound speed). While I liked that Ensemble’s score, the Blu-ray version features a brand new score performed by the Alloy Orchestra, an ensemble that specializes in silent film music. This is a definite plus since one of the pleasures of A Page of Madness is hearing new music prepared for the film. David Shepard unfortunately passed away in January 2017 (here is the NY Times obit). That was quite a loss, and I was also worried that it might interfere with the release of the disk. But what has come out is a good representative of the work of a fine film historian, who will be missed. You can order the disk from Amazon, but Flicker Alley only charges one dollar for shipping (even international shipping!) if you order directly from their site. The disk is region free.